Saturday: RideLondon Grand Prix live on BBC Two from 18:00-19:00 BST. 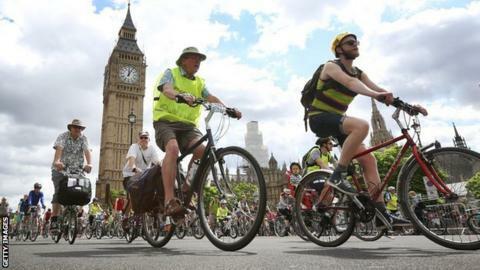 Sunday: RideLondon-Surrey 100 live on BBC Two from 10:00-10:30 and live text commentary from 10:00-14:30. RideLondon-Surrey Classic live on Red Button 14:30-15:30 and BBC One 15:05-18:35. There are many varied reasons why people are taking part in this cycle ride, from beating depression to overcoming cancer, here are some inspirational cyclists' stories. "An active life after cancer is possible"
Riding motivation: Garth was diagnosed with Parkinson's in 2009. Two years later he was diagnosed with bowel cancer. After years of working to reduce the tumour through chemotherapy, Garth's latest scan is clear. A keen cyclist, Garth has been training since his last operation in February. His hope is that through his involvement in RideLondon people will see that an active life after cancer is possible. Garth says: "Cycling is important to me. It has made me fit and strong enough to get through surgery. It has speeded my rehab and recuperation and most important of all it had a positive impact on my morale. "I hope to encourage fellow cancer suffers to set themselves sporting goals and to show that even if you have got the disease great things are still possible. "After four major operations and two rounds of chemo [training] was very hard at first. "I'm OK now along the flat but still have trouble with the hills. I tried Leith Hill a couple of weeks back and fell off halfway up so I m a bit worried about that on the big day." "Getting on a bike makes me feel free"
Riding motivation: Lisa trained as a nurse and health visitor before working at the NHS, where she remained for over 40 years until her retirement in 2014. For the last 13 years of her career, she was chief executive of the Mental Health Trust and was awarded a CBE for her services to the NHS in 2012. A sufferer of depression herself, Lisa now campaigns for better mental health services and reducing the stigma of mental illness. Lisa says: "I am going to be 60 just 11 days after Ride 100. "I want to approach my next few decades in the best possible physical and mental shape, and I know from experience how challenges like this can be a real spur. "I've always loved cycling. There is something about getting on a bike that makes me feel free. "I experience depression from time to time and getting out into the fresh air, doing something that requires a bit of skill and concentration that I can do on my own or with company can help to lift my mood. It's not by any means a cure for depression, but it can help with prevention." Watch this video to hear more from Lisa. "Cycling lets me abuse my body in a good way"
Riding motivation: Craig has a condition called Poland Syndrome - a rare disorder which causes the underdevelopment, or absence, of the chest muscles on one side of the body. Craig is missing fingers on his right hand and his right pectoral muscles. After years of feeling like he had to prove that he was "normal", sometimes to his detriment, Craig started to get an appreciation for his disability. Watching the 2012 Paralympic Games had a humbling effect on him, and he's been cycling ever since in the hope of making the GB team in 2016. Craig says: "When I was at school I was told I'd never be able to get into a trade because of my arm. I went through some jobs in factories but after that there was nothing really. I ended up going down the wrong path and got involved in things I shouldn't have. "Cycling lets me abuse my body in a good way. I abused my body the wrong way for years - this is pushing boundaries the other way. "In 2013 I completed the London Marathon, but I was so focused I didn't appreciate the crowds and atmosphere around me. I want to enjoy RideLondon. I want to help people if they are struggling because I've been there too. I want to get involved and ride for the love of cycling." Watch this video to hear more from Craig. "I am an absolute cycling novice"
Riding motivation: A new comer to cycling, Tracy joined Team Panda when her colleagues were putting together a team, but says she had no idea how prestigious the opportunity to ride was until she spoke to her brother-in-law. After losing over 20kg in the last year, Tracy has gone from a cycling novice to training on weekends on rides up to 60 miles long. Tracy says she's accomplished this with the support of her family and the help of cake. Tracy says: "I only bought my road bike back in March to do this challenge. "Last year was my Mum's 80th birthday, my sister's 50th birthday, my brother-in-law's 40th birthday and my 10 year wedding anniversary. I didn't want to be the fat person on the photos so I joined a dieting group and lost 3.5 stone. "I am an absolute cycling novice so I roped my brother-in-law to take part in the challenge with me. Our whole family has got behind us during our training but my mum was the biggest supporter. Sadly she passed away in May. "My Mum had been ill with myeloma but she was so supportive of my weight loss that I wanted to give something back." "I want to be an inspiration"
Riding motivation: Lesley Keddy will be riding the London-Surrey 100 in memory of her cycling heroine, Billie Fleming, who in 1938 rode over 29,000 miles across the UK to promote the health benefits of cycling. An advocate for cycling herself, Lesley is a British Cycling Breeze Women's Cycle Leader and wants to encourage more women to give cycling a go. Lesley says: "RideLondon is an iconic event. The fact it takes place on closed roads and follows the route of Olympians made me want to do it. I saw it as a great goal to work towards after taking part in the Billie rides. "We have been in touch with Billie Fleming's son and got hold of her diaries, so we know where she went on each day of the year. We're trying to get ladies out to cover each of the towns she rode on each day. So far we haven't had a day where we've been unable to get someone out - I have done quite a few of them and they're fantastic. "Riding it [the 100] in her memory will be a great tribute. I think it's hugely important that more women get out there and give cycling a go. I've never done RideLondon before so I'm really looking forward to it and I want to be an inspiration to the ladies I encourage to cycle." "Were a real mixture of abilities in our team"
Riding motivation: Six senior members of staff, alongside local hospital supporters, will be riding the 2015 London-Surrey 100 to raise money for equipment that will make keyhole surgery more efficient and success rates higher at Southend Hospital in Essex. The new machinery will enable surgeons to perform the latest and most complex keyhole procedures for patients undergoing cancer and general surgery, benefiting hundreds of patients each year. One of the team, Mr James Wright, says: "There are a real mixture of abilities in our team. One of our consultants, Esther Fine, for example, hadn't done any road cycling before at all. For others, like another consultant, Mike Dworkin, it's about getting a good time. I'll be happy to get to the end and finish the course. "If you had asked any of my colleagues, they would have told you I like to snaffle doughnuts in the lunchroom, they wouldn't have believed I have the physical prowess to sign up for an event like this. "It's difficult to train when you work shifts and weekends, plus we are on our feet a lot of the day. At first it was a real struggle to and I'd often start training in a bad mood, now I look forward to it and try to find opportunities to get on my bike." Sport Relief 2016 Needs You! Read more on Get Inspired: Sport Relief 2016 has something for everyone – sign up now!